In Journey to Virginland, Armen Melikian presents a jaw-dropping exposé of the Judeo-Christian legacy and other monotheistic systems, arguing brilliantly for religious revolution. Yet Melikian has neither pretensions of guruhood nor a prescription for a new religion per se. Rather, his call for revolution is a humanist’s entreaty for meaningful spiritual, philosophical, and emotional evolution, whereby the blinders are lifted to reveal our genuine potential for constructive transformation. Published in 2012, this novel, the first installment of a trilogy, quickly established Melikian as a brilliant novelist and an extraordinary thinker. Seamlessly weaving the story of Dog, his outrageously omniscient antihero, with a world of ideas, Melikian engages in a barrage of commentary on history, mythology, religion, politics, philosophy, and the quagmire of the genders, advocating religious revolution in, first and foremost, the heart and mind of the individual. As arrived at through Melikian’s painstaking yet beautiful, richly imagined analyses, religious revolution is fundamentally a function of intellectual self-liberation. Take obdurate, blind faith out of the equation, and the rest will follow, the author intimates as he makes the case for a religious revolution that is all but synonymous with human evolution itself. Looking for a novel that explores religious revolution? 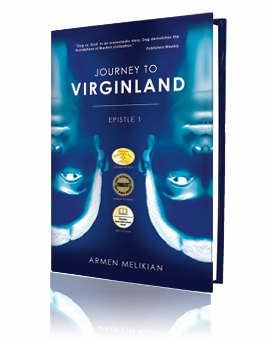 Get your copy of Journey to Virginland today!